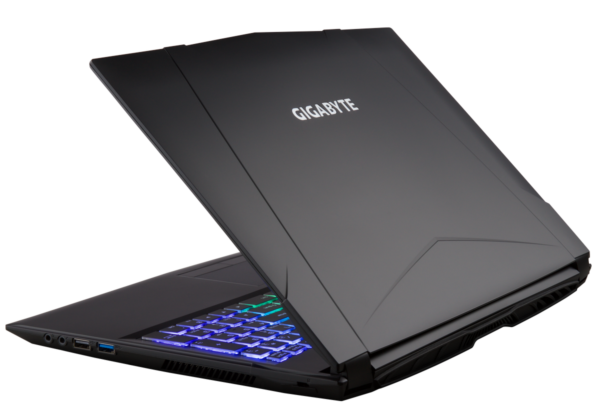 Gigabyte takes advantage of the Computex 2018 show to highlight 2 new gaming laptops, the Gigabyte 15.6 “Gigabyte Saber 15 and 17.3” Gigabyte Saber 17 equipped with a dedicated NVIDIA GTX graphics card and a Coffee Lake processor latest generation Hexa Core. 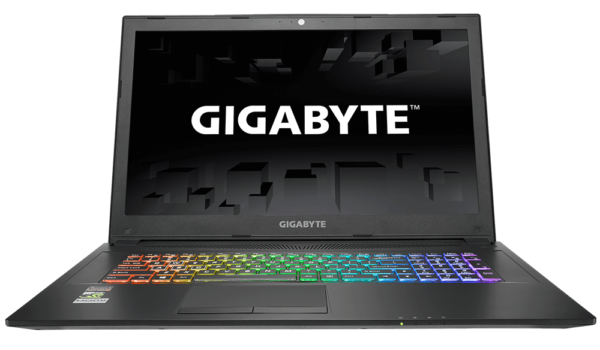 The new Gigabyte Saber 15 notebook is built around an Intel HM370 chipset, 8/16 GB DDR4 2400 MHz RAM (max 32 GB, 2 slots) and especially a latest generation Coffee Lake Hexa Core i7 processor. 8750H (2.2 GHz) with Intel UHD 630 graphics. 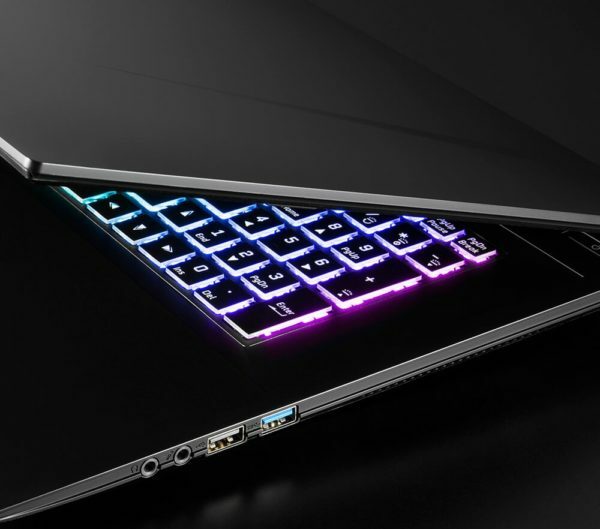 Equipped with a 15.6-inch anti-reflective screen 120Hz Full HD (1920×1080) Wide View (and therefore no IPS before) 3ms 94% NTSC, it has a backlit chiclet keyboard RGB (race 2mm Flexikey). Side storage, Gigabyte provides 2 slots: 1 to 2.5 inches for hard disk, and 1 to M.2 NVMe PCIe x4 or SATA 3.0 for SSD 2280. Connectivity side, there is a card reader 6-in-1 SD / mini SD / SDHC / SDXC / MMC / RS, Wi-Fi wireless modules ac, Bluetooth 5.0, HDMI 2.0 (HDCP 2.2, support 4K @ 60Hz), mini DisplayPort 1.2, mini DisplayPort 1.3, Gigabit Ethernet, Headset, Mic, 1 USB 3.1 (Gen2), 1 USB 3.1 (Gen1), 1 USB 2.0 and 1 USB 3.1 Type-C (Gen2). 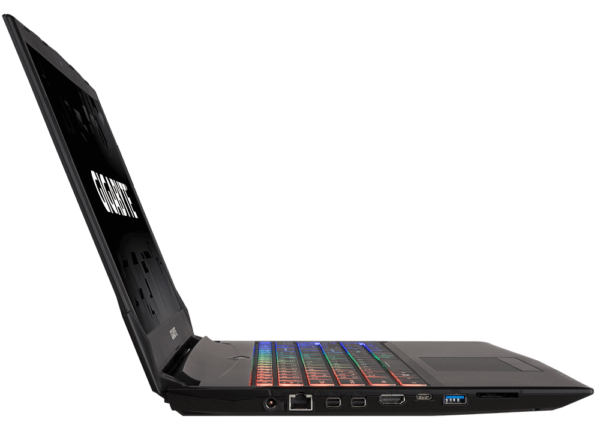 The new Gigabyte Saber 15 is also equipped with an HD webcam with microphone and 2 speakers of 2W Sound Blaster Cinema 5. It weighs 2.5 Kg with its 6 cell battery 5500mAh 62Whr (power adapter 180W), measures 378 x 267 x 29.9mm, weighs 2.5 Kg and runs on Windows 10. Here cooling is entrusted to Supra-Cool technology combining 2 fans with copper heat pipes. 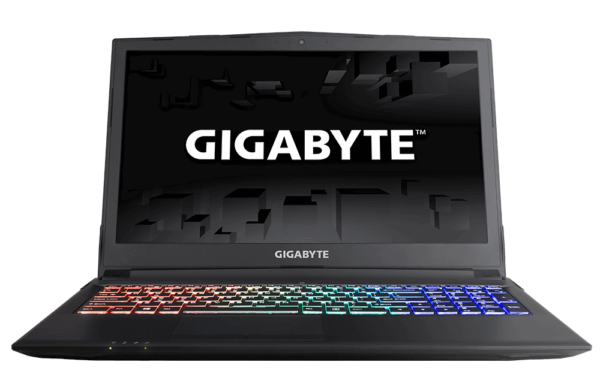 The Gigabyte Saber 15 Notebook PC promises to be a 15-W8 Saber with a dedicated GeForce GTX 1060 6GB GDDR5 dedicated graphics card and NVIDIA Optimus technology . It also comes in Saber 15-K8 version with a 15.6-inch IPS Full HD screen (1920×1080) 72% NTSC and a dedicated GeForce GTX 1050 Ti 4GB GDDR5 GPU . Here, the HDMI video output is 1.4b standard while the speakers are a little less powerful (1.5W) and the Bluetooth announced in 4.2. We must also be satisfied with a 4200mAh 47Whr 6-cell Li-Ion battery (120W adapter). In return, the chassis is thinner and lighter, with dimensions of 378 x 267 x 26.9mm for a weight of 2.2 Kg. We also find the Saber 15-G8 which adopts a configuration similar to the Saber 15-K8 with the exception of the dedicated graphics card, here a GeForce GTX 1050 4 GB GDDR5 dedicated. 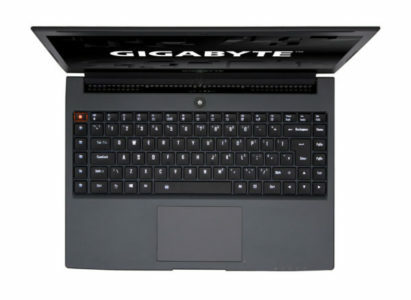 In addition, Gigabyte offers its new Saber 17 laptop, which also comes in 3 models. 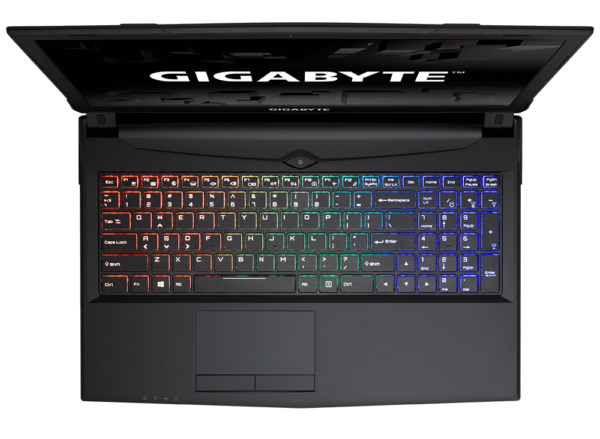 The Gigabyte Saber 17-W8 is very close to the Saber 15-W8, standing out by its weight of 2.8 Kg and its dimensions of 418.5 x 288.7 x 29.9 mm. 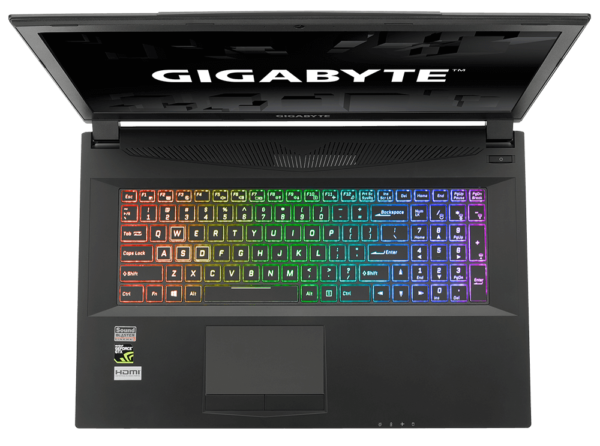 The Gigabyte Saber 17-K8 is close to the Saber 15-K8, with the exception of Bluetooth version 5.0, weight 2.7 Kg and dimensions of 418.5 x 288.7 x 27.4 mm. 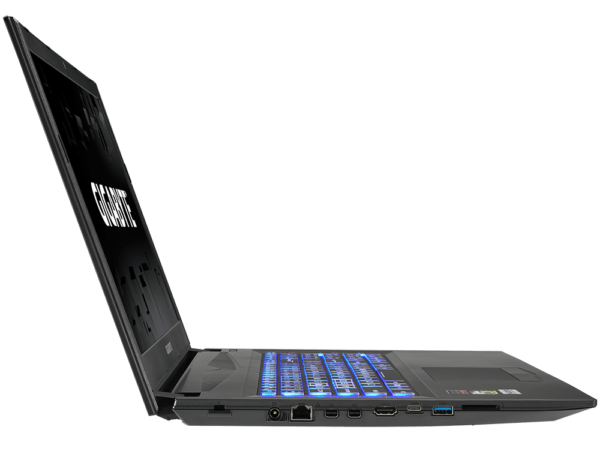 As for the Gigabyte Saber 17-G8 , it differs from the Saber 17-K8 by its GPU GeForce GTX 1050 4 GB GDDR5 dedicated.